An electrical grid is a network that delivers electrical power from the power plants where it is generated to customers. See Figure 1. An electrical grid includes wires, substations, transformers, and switches. Definition: A smart grid is an electrical grid that uses computer-based remote control and automation to deliver electrical power from where it is generated to customers. In order to improve the delivery of electrical power, the continual developments in smart grid technology can be used to make a power distribution system more intelligent, efficient, and secure. Figure 1. 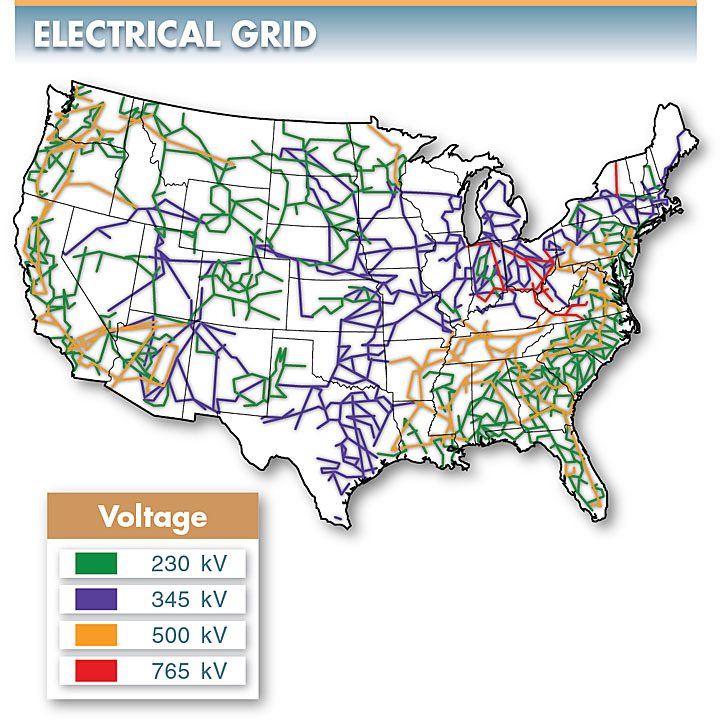 An electrical grid is a network that delivers electrical power from where it is generated to its point of use. Upgrades to the electrical grid allow each critical component, such as substations and transformers, to have two-way communication. In this case, each device or location would be capable of calling for assistance if it were experiencing problems. It could also be called back to see the extent of the problem. For example, if a critical component such as a transformer was overloaded or overheating, a message would go out to a monitoring station. When this information is received, the power could be rerouted until the transformer is inspected or replaced. 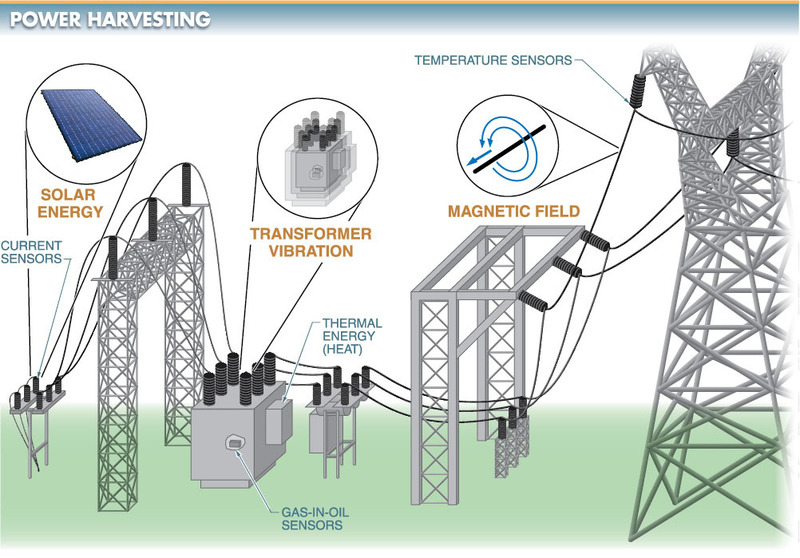 The monitoring station could also remotely call up the transformer and, with proper diagnostic software, determine its current condition and efficiency. Two-way communication also allows one or more power sources on the generation side of the electrical grid to be accessed remotely and routed to a location needed by the customer, depending on the type and amount of power needed. The power may come from a centralized power plant, wind farm, or photovoltaic (PV) array. Traditional centralized power distribution systems are aging and cannot keep up with the high demand being placed on the systems. Distributed power generation, interactive distributed generation, and microgrids are used to provide alternatives to aging centralized power distribution systems and relieve some of the stress of high demand. Definition: Distributed power generation is the use of small-scale power generation technologies located close to the loads that are being served. Distributed power generation systems can include PV arrays, wind turbines, biodiesel generators, and other relatively small-scale power systems. See Figure 2. 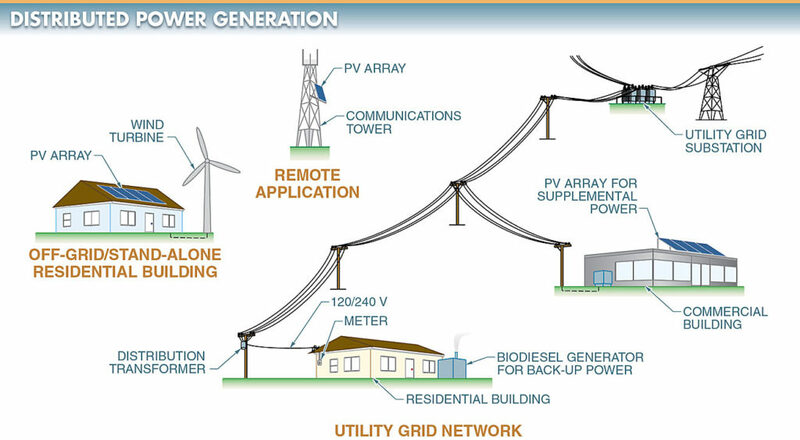 A distributed power generation system may serve as the only source of power for residential, commercial, industrial, or remotely accessible areas. A distributed power generation system may be a stand-alone system or combined with a centralized power distribution system. Figure 2. Distributed power generation produces electricity close to where it is used. Interactive distributed generation systems are also small power generating systems. These systems must be interactive to connect to the utility’s distribution grid for two-way power. See Figure 3. Interactive distributed generation of electrical power is increasingly common as a supplement to traditional centralized power generation. This increases the diversity and security of the electrical energy supply and benefits both customers and electric utilities. Figure 3. With interactive distributed generation, utility customers are served by both the centralized power plant and the power exported from interconnected distribution generators. For customers, these systems can provide power to on-site loads and back up their stand-alone systems in the event of a utility power outage. For utilities, the additional power sources supplying capacity during peak loads increases the utility’s capacity to serve customers without the need to build new power plants. For example, back-up generators are generators that are placed in a fixed location and connected to the power distribution system through a manual or automatic transfer switch. When utility power is out, the back-up generator provides power without the need to unplug devices from receptacles and plug them into the generator. Backup generators normally supply power only to the loads that must have power during a power outage. A transfer switch detects when utility power has been removed, disconnects the utility distribution system from the loads, and connects the generator to the loads. Transfer switches and generator control circuits can be manually operated or completely automatic, starting the generator and automatically controlling the power as needed. See Figure 4. Advanced metering infrastructure (AMI) consists of new sensors, communication networks, and data management systems that are used to modernize the electrical grid and provide new capabilities to utilities and customers. An AMI system is composed of sensors, smart meters, and meter data management (MDM) systems, wide-area communication, and home area networks (HANs). Smart meters equipped with power quality monitoring capabilities enable more rapid detection, diagnosis, and resolution of power quality problems. AMI provides for self-healing by helping outage management systems detect and locate failures quickly and accurately. Power generation and storage options at the customer level can be monitored and controlled. AMI data provides the information needed to greatly improve asset management and operations. Before AMI, utilities typically learned of outages when customers reported problems. Often repair crews were dispatched only to find problems were on the customer’s side of the meter. An AMI solution provides automatic notification of outages. For example, smart meters alert the utility when a customer loses power. This helps pinpoint outages quickly. An AMI system also accurately records and sends messages on behalf of each meter and sensor when power is restored so utilities can see whether outages have been restored. AMI implementation also reduces the need for everyday meter readings since readings are taken automatically and regularly. Meter technicians used to be the first defense against energy theft. New systems fill this void with built-in analysis tools to detect possible theft or tampering. By analyzing real-time data and comparing it with historical trends from the same meter or similar customers, MDM systems can identify patterns likely to suggest theft or tampering. The system then automatically generates work reports for field managers to investigate. MDM systems can be linked with supervisory control and data acquisition (SCADA) management systems. As more power is delivered through the current electrical grid, renewable energy sources such as solar energy and wind are raising concerns on how to maintain electrical grid balance and stability. Balance can only be maintained and power quality increased through the precise measurement of voltage and current waveforms at multiple points on the grid. Phasor measurement is a technology that can help maintain stability in the power grid. Definition: A phasor measurement unit (PMU) is a device that measures electrical waveforms on the electrical grid. The unit of measure is the phasor. PMUs are also referred to as synchrophasor. PMUs provide information to operators and planners to measure the state of the electrical grid and manage power quality. PMUs are precise grid measurement devices, taking measurements as often as 30 times per second. SCADA data is only taken around 4 times per second. PMU measurements are time-stamped to a common time reference provided through GPS tracking satellites. Coordinated Universal Time (UTC) timestamps allow PMU data from different utilities to be synchronized and combined together to give a comprehensive view of all utilities affected. PMUs provide more precise information for analysis. The use of this type of measuring system creates an accurate and reliable source for locating line faults. For example, with the time of signal travel, the signal sent down the power line can be used to pinpoint faults to within a few feet. A similar technique is used to determine faults in a fiber optic cable by sending light through the cable and determining the time of the return signal from the problem. 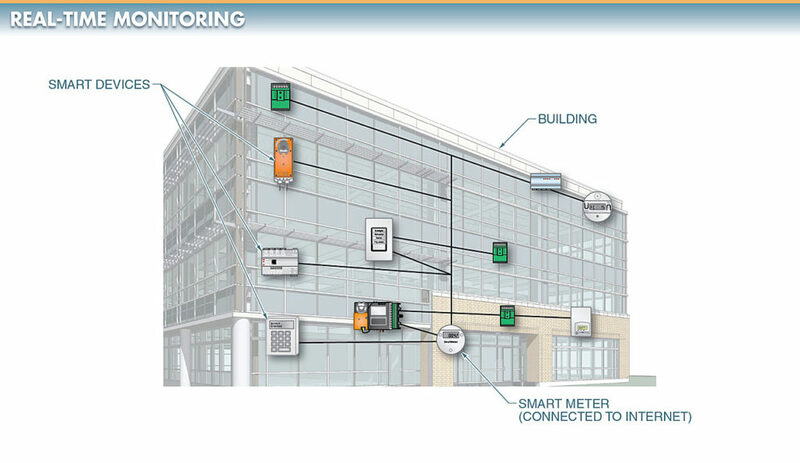 Real-time monitoring and sensing are an essential component of a smart grid. The power industry has only recently begun to move to real-time monitoring systems to provide up-to-date information using two-way communication. At the utility level advancements are occur- ring more rapidly on the transmission side as compared to the distribution side. The next-generation networked sensors have measuring and processing capabilities that help locate a faulted line and identify parts of the grid that might be susceptible to outages before they occur. For example, next-generation networked sensors can highlight power fluctuations that might be the result of a tree limb contacting a power line. Another move the power industry has embraced is employing digital electronics in metering. At the customer level, electronic metering is still in development. One of the concerns of introducing new devices is interoperability and the idea that certain technologies may be discarded if different technologies became standard. It is certain, however, that in the future no meters will be based on electromechanical technology. Instead, meters will be digital and will communicate with both the customer and the utility. This technology will also use the Internet. See Figure 6. Figure 6. Smart meters allow for remote control by owners and utilities. For sensors on the smart grid, the power may not be available across the entire power distribution system. This is true on many transmission towers. Batteries are often used to offset the lack of power. However, batteries eventually need to be recharged. To meet this challenge, a new power method called power harvesting is being introduced as part of the emerging smart grid technology. Definition: Power harvesting is the process of obtaining power from the surrounding environment. See Figure 7. The primary sources of power harvesting are solar energy, vibration, magnetic fields, thermal (heat) energy, and radio frequency (RF) waves. Figure 7. Power harvesting is the process of obtaining power from the surrounding environment and using it to power sensors. New power sources are essential for the widespread use of sensors throughout the smart grid. Many challenges face these new technologies. For example, a few of these challenges include the energy storage of solar-based sensors for use at night, the ability to charge batteries in subzero temperatures, and the useful life of rechargeable batteries. Microprocessor-based digital relays provide metering data, status information, and fault location, in addition to protection functions. The data is accessed through relay communication ports, local displays, or other human-machine interfaces (HMIs). Many individuals within a utility organization use the data. For example, operators may need to know the fault location for a particular electrical disturbance. Fault type and fault location, unavailable until the creation of fault-locating digital relays, are now required by most operating and dispatch centers to guide system restoration. Digital relays use microprocessors to measure power (currents and voltage) and process this information through their internal logic to control the operation of a circuit breaker. 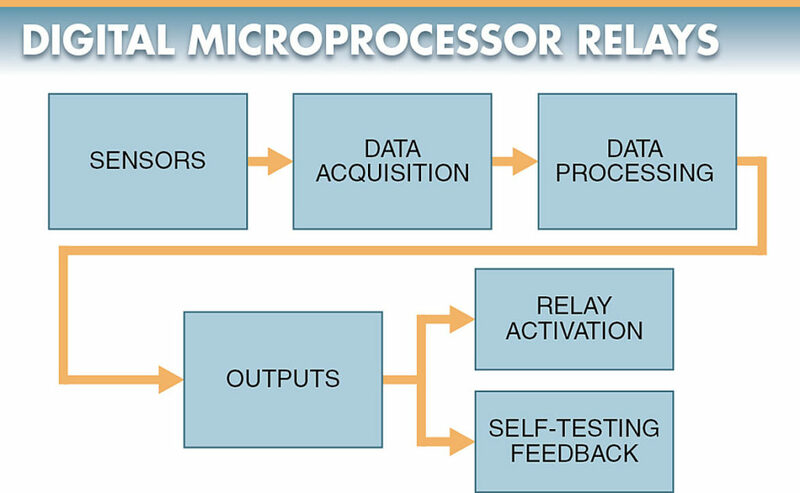 A digital relay is also referred to as a microprocessor-based relay. A digital relay consists of sensors that monitor voltage and current and input this information into a data acquisition module that converts the signal from analog to digital output. See Figure 8. The digital information is then analyzed by the data processing module to determine what outputs are needed. These outputs can be used to activate the digital relay or send feedback information to the operator on how the relay is performing. Most digital relays have automated self-test functions that verify the correct operation of the relay. When a self-test detects a problem, a message indicating some type of failure is transmitted. Figure 8. Digital relays process information received from sensors and determine an appropriate output to control a circuit breaker. Digital relays allow the utility to change protection settings and logic based on the time of day and day of the week. Protection requirements may change as the system load changes. Original settings are usually quite sensitive. Other settings may be less sensitive and tolerate higher loading. Other settings may be engaged when the digital relay triggers. When conditions return to normal for a period of time, the digital relay returns to its original settings. Definition: Pulse closing technology is a unique means for verifying that the line is clear of faults before power interrupters are reclosed. Pulse closing technology works by rapidly closing and reopening the power interrupter contacts at a certain point on the power waveform to generate a low-current pulse in the power line. Then the pulse closer analyzes the pulse to determine whether the contacts should reclose or remain open. Pulse closing technology is a breakthrough in overhead distribution system protection up to 27 kV. Pulse closing is a superior alternative to conventional reclosing. It significantly reduces stress on system components and improves power quality by reducing the voltage sags experienced by customers upstream of a fault. Pulse closers are completely self-contained. See Figure 9. Embedded voltage and current sensors provide Three-Phase monitoring of line current and Three-Phase monitoring of line voltage on both sides of each interrupter. The units provide a complete set of protection and control functions, with comprehensive diagnostics. Figure 9. 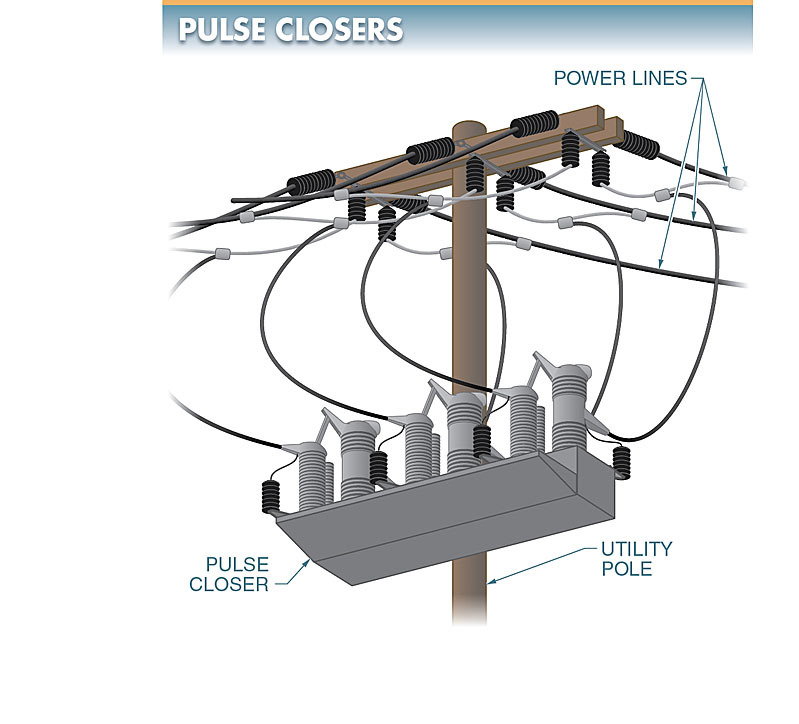 Pulse closers verify that a power line is clear of faults before reclosing power interrupters. The communication module can provide a short-distance, secure Wi-Fi communication link to a nearby personal computer. A secure Wi-Fi connection can be used with a laptop computer to quickly and easily access and transfer detailed logs, geographical data, and other operational information over the wireless link. A global positioning system (GPS) chipset in the communication module provides 1 ms accurate time-stamping of events to speed event analysis. It also provides location data. With RF communications, system operation checks, diagnostics, downloads, and even uploads of new software can be accomplished. This communication system eliminates costly field visits to the equipment after it has been installed. A memory module, installed in the base, backs up configuration data and site-specific information such as the device identifier, sensor calibration data, and operation counter reading. This system also allows passwords and security clearances to be established.